Michael Layward, Duke of Wyverne, much prefers his busy life on his estate in Lancanshire reclaiming land for planting and researching ways steam power can make his estate more productive. But it is 1816, the Year Without a Summer, and Wyverne’s fields are yielding little, barely enough to feed his tenants. His coffers are empty, and his credit is gone. Necessity drives him to London, a place he has managed to avoid for eleven years. His only hope for meeting his responsibilities and seeing the duchy prosper is to find a wealthy bride who is willing to exchange her fortune for his title. Michael knows his search will not be easy. Few women will be eager to ally themselves with the “Mad Duke,” a title Michael’s eccentricities, reclusiveness, and intolerance for society has earned him. Caroline Graves, Countess of Stratton, is enjoying the freedom and power afforded by her status as a wealthy widow except for the suitors who lust after her beauty and fortune. It is her desire to escape from the most importunate of them that leads her to claim she has promised a dance to Wyverne. Michael and Caroline share a history that both would prefer to forget but which is etched painfully and indelibly in both their memories. If Caroline can help Michael find the wealthy wife he needs, maybe she can increase her popularity in London by accomplishing the impossible feat of making the mad duke’s bride hunt successful and maybe she can forget Michael as well. Fresh peach cobbler has been one of my favorite desserts since I was a very little girl eating it just out of the oven in my grandmother’s kitchen. After decades of relishing its taste, I still love it. The basic ingredients of Georgia peaches, sugar, cinnamon, nutmeg, and lemon juice with bits of sweet crust make a luscious dish, but every once in a while I happen across a variation that includes something surprising--a touch of butterscotch or ginger or rhubarb—that awakens my taste buds and gives me a new appreciation for an old favorite. By now you’re probably thinking this reviewer is as mad as Romain’s duke hero was purported to be, but trust me a few seconds longer. I promise to tie my recipe ruminations and review together. Historical romance is like my grandmother’s peach cobbler: beloved, familiar, and reliably delicious. To Catch a Naughty Countess is the new variation: a combination of familiar elements and new ingredients that delights in myriad ways. I couldn’t begin to count the duke heroes I have encountered across decades of reading historical romance, but Michael is an original. He is brilliant and brave, with a rough honesty and a thinly veiled vulnerability that I found immensely appealing. He suffers from social anxiety disorder and thus is terrified of humiliating himself by proving inadequate in social situations and thereby confirming that he is as mad as the rumors proclaim him. Not since Jennifer Ashley’s Ian Mackenzie have I found a hero as courageous, poignant, and ultimately as admirable as Michael. I adored him. Caroline is just as wonderful in a different way. Having once been limited to only the power her beauty gave her, she fully understands and enjoys the far greater power she possesses as a widow with both beauty and wealth. Her strength is credible because it is rooted in the realities of who she is as an individual and as a woman of her particular time and class. She also has a practical wisdom, an appealing lightness that is anything but shallow, and a generous spirit. What she wants most is something readers will understand—to be seen and loved for who she truly is. 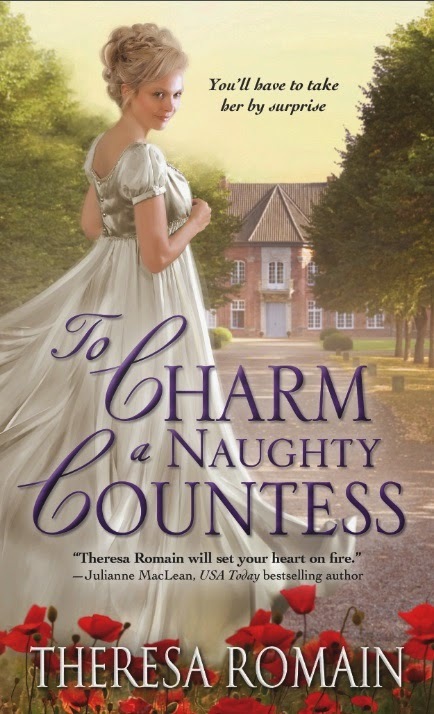 I’ve been a Theresa Romain fan since her debut with Season for Temptation, but I think To Charm a Naughty Countess is her best book yet. It charmed this reader into an immediate reread in order to savor the many things I loved about it. If you are a reader who appreciates traditional historical romance, protagonists who are out of the ordinary, and endings that are satisfyingly romantic but with a realistic touch that makes them more believable, I highly recommend this book. I recently loved It Takes Two to Tangle, and so had this one on my radar. Have it now to read the next couple days, so happy to see such a great review. Hi Pam! I have It Takes Two to Tangle on my tbr along with To Charm a Naughty Countess. They'll both be going with me to the beach next month, especially after reading Janga's review. Wow! 5 stars! I do like this author. Thanks for the excellent review! I like her too, Laurie. Can't wait to read this one! I've always enjoyed Theresa's books, and this sounds like another great read. Thank you for the review. I like Romain's voice and style, so I'm predisposed to like her books. But even so, I think this one is exceptional. I added it to my running list from which I will choose my Best of 2014 books. And I already have It Takes Two to Tangle on Best 2014 list. Love the cover of this book and I can't wait to read it. It sounds awesome. I too loved the first book in this series and have another in my tbr pile but need to catch up on the other two! Oh, great! I am so glad you loved this one - I just bought it the other day! I was drawn in by the cover, of course, but the description was attractive to me, too! I haven't read Ian Mackenzie, which I also have on my TBR stack. That is on so many "best" lists. Thanks for the great review, Janga. I also adore Ian Mackenzie. This has been the book I've been looking forward to reading for a long time. This one is definitely on my must read list. It is nice to see characters that are "out-of-the-box" and not from the usual mold. Vulnerability is so very human and appealing. I look forward to reading this.